Overview - The Moment of Truth, from director Francesco Rosi is a visceral plunge into the life of a famous torero—played by real-life bullfighting legend Miguel Mateo, known as Miguelin. Charting his rise and fall with a single-minded focus on the bloody business at hand, the film is at once gritty and operatic, placing the viewer right in the thick of the ring’s action, as close to death as possible. Like all of the great Italian truth seeker’s films, this is a not just an electrifying drama but also a profound and moving inquiry into a violent world—and perhaps the greatest bullfighting movie ever made. While many claim they're willing to die for their art, very few actually find themselves in such a predicament. For bullfighters, that's exactly the type of situation they face every time they get into an arena, risking their lives for the sake of their craft. While that courage and dedication is commendable, it should also be noted that very few other art forms actually call for their artists to kill an innocent living creature. 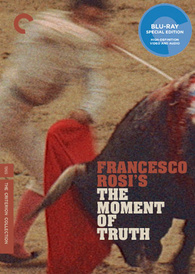 This uneasy dichotomy between meaningful expression and harsh brutality rests at the core of Francesco Rosi's 'The Moment of Truth,' presenting an interesting but sometimes disturbing peek into a world most know nothing about. Though there is no denying the artistic merit of the director's approach, many will likely be turned off by the vicious realities of the subject matter itself, which result in an often uncomfortable viewing experience marked by oscillating moments of savage beauty and unnerving violence. Seeking success in the city, a young man named Miguel (played by Miguel Mateo, an actual torero) decides to try his hands at bullfighting. After taking lessons and convincing promoters to give him a chance, he gets his big shot in the ring. Proving popular with audiences, Miguel quickly rises to stardom. While he enjoys the sweet life of success, he remains ever vigilante of the harsh dangers that await him every time he fights. With the stakes and rewards increasing exponentially, Miguel must decide whether to continue risking his life or opt out for a simpler existence. The director employs a realistic, documentary style to the proceedings, using many non-professional actors, including his star. A fly-on-the-wall visual approach is used frequently, emphasizing everyday life, common actions and ordinary situations. Montages of crowds and numerous shots of real life extras add a layer of verisimilitude, creating a gritty mosaic of images, free of the artificiality that plagues most moviemaking exercises. With that said, the director does offer a few instances of more painterly compositions, creating periodic moments of visual beauty within the realistic style. Extended bullfighting sequences make up a large chunk of the running time, showcasing the violence and skill of the art form. Shot with 300mm lenses, Rosi gets an up close view of the action, giving the audience an intimate and dramatic peek at the very real dangers a torero faces. A thin and loose story is structured throughout, highlighting Miguel's gradual rise toward bullfighting prominence as he builds his skills and climbs up the ranks. When success is achieved the movie draws some interesting parallels between the extravagant yet empty pleasures of wealth, and the simple joys of an uncomplicated life, while also touching upon themes of courage, greed, exploitation and brutality. Despite these plot points, the film is mostly devoid of traditional dramatic beats and while this approach is refreshing, there are times when it becomes hard to get a real sense of Miguel's character, leaving little for the audience to latch onto. 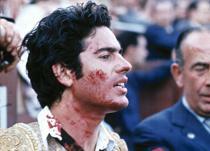 It's difficult to discuss the movie without addressing the ruthless realities of bullfighting. Though I understand that the sport is a cultural staple of the region, and I do indeed recognize the skill, and even artistry behind it, at the end of the day it really is nothing more than a romanticized form of animal cruelty. All of the fights featured are real and watching the bulls get taunted, stabbed and eventually slaughtered is difficult to stomach (to say the least). In fact, I was always rooting for the animal to win. To his credit, Rosi seems to be acutely aware of these unsavory aspects, and the manner in which the violence is depicted is both raw and multi-faceted, forgoing any kind of celebratory quality. The quasi-documentary approach also helps the picture in this regard, with the filmmaker neither completely condoning nor condemning the actions as they occur -- they simply are. At several points throughout the matches there are brief moments where a kind of mutual respect forms in the eyes of the matador and bull, a certain kinship between man and animal that is almost beautiful to watch. That is, until the bull is viciously murdered. It's a complex issue, and the director does treat it as such, and though my own personal opinions on the matter are strong, it should be noted that those feelings did not influence my overall assessment of the movie. Visceral and thrilling, 'The Moment of Truth' presents a gritty, realistic examination of a torero's dangerous life. The quasi-documentary style creates an authentic atmosphere that is creatively potent but dramatically thin, somewhat lessening the audiences' emotional investment in the story. Despite the film's artistic merit, the subject matter might rub many viewers the wrong way. While I ultimately judged the movie on its cinematic value rather than the morality of its content, audience members who are sensitive to animal rights issues might want to steer clear. Those that aren't as easily deterred by such matters, however, should find a unique and worthwhile experience that is much more than a simple exercise in savagery. Criterion presents 'The Moment of Truth' in their standard clear case with spine number 595. The BD-50 region A disc comes packaged with a booklet featuring an essay by critic Peter Matthews. The movie is provided with a 1080p/AVC MPEG-4 transfer in the 2.35:1 aspect ratio. With a naturally rough, harsh appearance the image is underwhelming but still effective. The source print is in pretty good shape, with only a few specks and scratches. A moderate to heavy layer of grain is visible throughout, reinforcing the gritty documentary style of the photography. Detail ranges from decent to good with some sporadic instances of impressive clarity, particularly in close ups and wide shots of the massive crowds in the bullfighting arenas. With that said, the image has a mostly flat appearance with few instances of impressive dimension. Colors can be fairly drab and faded though certain hues do pop from time to time, especially the red of the bullfighters' capes. Contrast is fine with nice whites and consistent blacks. Unfortunately, there are some signs of digital sharpening and minor edge enhancement is visible in a few shots. 'The Moment of Truth' comes to Blu-ray with a serviceable but unimpressive transfer. Certain aspects of the picture are simply a result of the movie's intended aesthetic, but regardless, the resulting image lacks depth and distinction. The movie is presented with an Italian LPCM mono track and optional English subtitles. Though serviceable, there are some technical hiccups in the mix that can be bothersome. Dialogue is clear but thin, lacking the kind of fidelity found in modern tracks. In addition, there is a disappointing amount of background hiss and static audible in several scenes. Though annoying, these age related problems are understandable and don't quite ruin the experience. Effects and score are handled well enough, with bustling crowds showing off some decent range. Like many older mono tracks, low end activity is minimal. The mix gets the job done but features a bit more hiss and static than other Criterion releases from the same time period. These anomalies are annoying, but certainly aren't deal-breakers. Francesco Rosi (HD, 14 min) - Presented in 1080p with Italian Dolby Digital 1.0 sound and English subtitles, this is an interesting interview with the director that was conducted in 2004. Rosi discuses a variety of topics, including how the project came together, the documentary style of the shoot, casting non-actors, and the artistic and technical methods used to film the bullfighting. The morality of the sport is also briefly touched upon. Though short, the director's comments are certainly worth hearing. 'The Moment of Truth' offers a realistic peek into the dangerous world of professional bullfighting. Though its violent content and graphic depictions of the sport might distance many viewers, there is no denying the film's artistic merit. The video quality is underwhelming and rough but mostly authentic, and while the audio track features a disappointing amount of hiss and static, it gets the job done. Supplements are sparse, but the director's brief interview is certainly worth your time. Though a decidedly lesser release from Criterion, the movie is definitely worth a look, provided you can accept the divisive content.